Let me start this brew with full discretion: I have never had a milk stout before. They're pretty pricey. Too pricey for my meager monthly beer allowance, at least. However, my dad's been taking up Saugatuck Brewing Company (SBC)'s Neapolitan Milk Stout since he first tried it months ago. 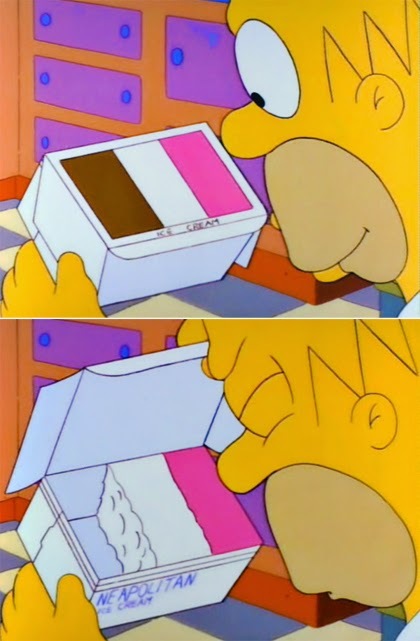 According to him the beer actually contains all three flavors found in neapolitan ice cream, which (unless your Homer Simpson) you probably know are as much vanilla and strawberry as it is chocolate. I shouldn't have to say this but I didn't create, nor do I own, The Simpsons. That'd be Matt Groening and 20th Century Fox, respectively. Since he first tried it my dad's been on the lookout for the Neapolitan whenever he's around Saugatuck (located within the state of Michigan) but he's never been able to find it bottled, and every time he's bought a growler of it I've never been able to make it up to visit before its expiration date (don't worry, he always polishes it off before it goes bad). Last weekend we were in the area visiting family when my dad and uncle found it bottled and in a store. It was $14 for a four pack (see, even this milk stout is too pricey for me!) but my dad snatched it up and gave me a bottle to bring back to Cincinnati with me for the express purpose of writing about it. Well, Dad, to thank you here's my post on it. Since I don't have the package that still contains the remaining three bottles, the only information I have (without looking it up online) is that SBC's Neapolitan is 6% ABV and that the bottle holds twelve ounces (no surprise there--that's what your standard bottle holds). I'm not lazy, though, so I actually did look online for more information. SBC's website states that the brew contains nine different malts, two kinds of hops, and lactose (because, you know, it's a milk stout). The beer's creators also claim, just like my dad, that it contains all three flavors found in neapolitan ice cream. Taking in the beer's aroma, the strawberry scent is extremely prominent. Purrl may or may not care for strawberries, which could explain why she gave this beer the least amount of sniffage of any I've discussed thus far: six. 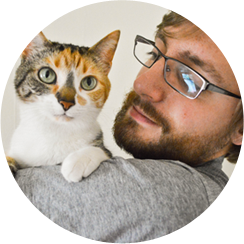 However, six still sits squarely within her "good" range. Upon tasting the brew, it's obvious why it's in her good range. It's a dessert beer and should be consumed as dessert beer: nice and slow so you can get the most of every swig. If you were crazy you could pound it down like you would keg beer at a college party. Crazy people do stupid stuff all the time. But, if you did that, you'd miss out on everything this beer has to offer. My dad and SBC's website were absolutely right. 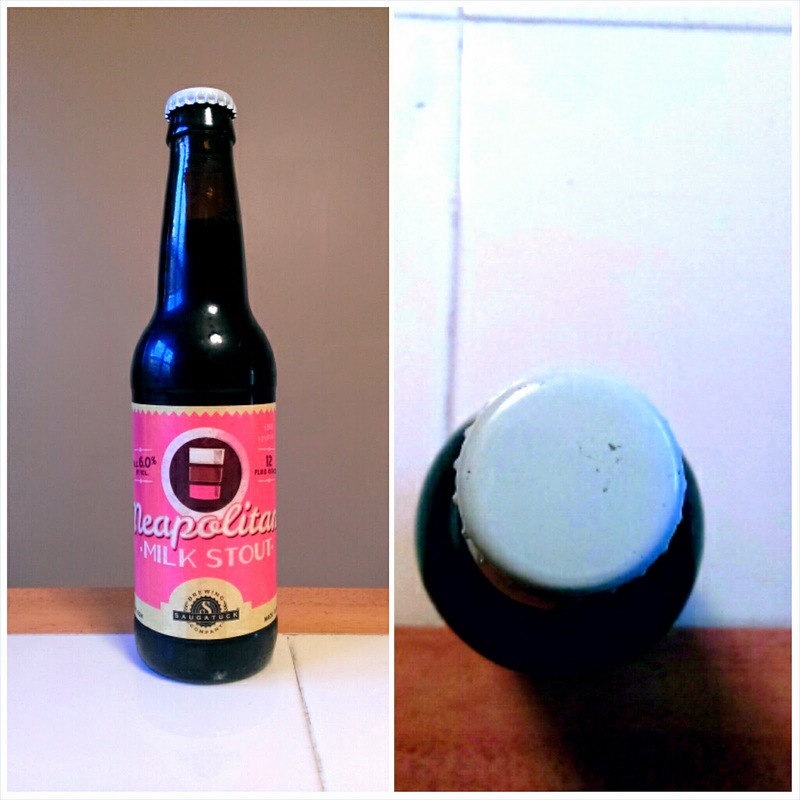 The Neapolitan Milk Stout really does have chocolate, strawberry, and vanilla in each mouthful. It's indescribably intriguing, and each swig I take is presented differently. One time, it's vanilla and chocolate up front, with strawberry as an aftertaste. The next, it's strawberry and vanilla first, with chocolate lingering behind. This is most likely a direct result of the cold I've had since mid-November that's worsened recently (if I were well, it'd probably be the same presentation every time, and I'm willing to bet that chocolate would be the final taste). But the important thing here is that each flavor is present and duly marked. This is much smoother than I expected a milk stout to be. Like I said, SBC's Neapolitan is the only one I've had but I imagined it would be thicker, chewier. Maybe this is so consumers can better focus on what's happening to their tastebuds than the rest of their mouths. I don't know. Like I said, the brew's intriguing. I have more experience in neapolitan ice cream than I do milk stouts, but not much more. I'm a bigger strawberry, vanilla, and chocolate ice cream separately than together. Therefore, I'm recollecting twice (not thrice--the vanilla isn't doing anything for me memory-wise) as much as I have in my previous posts. One part of me is a kid again, sitting in an ice cream shop in Oklahoma, where I lived from the ages of three to six, on a hot day eating strawberry ice cream. I'm remembering the shop as a Baskin-Robbins but I could be mistaken. Strawberry was, as it is and always will be, my favorite flavor. Even then I found the frozen chunks of fruit in it to be a very compelling addition. The other part of me is with my girlfriend visiting her family last summer. Her little brother (he's seven as of this writing) always has a snack as he watches cartoons before bed. Chocolate ice cream is his go-to, and I can usually be persuaded to have a bowl as well. 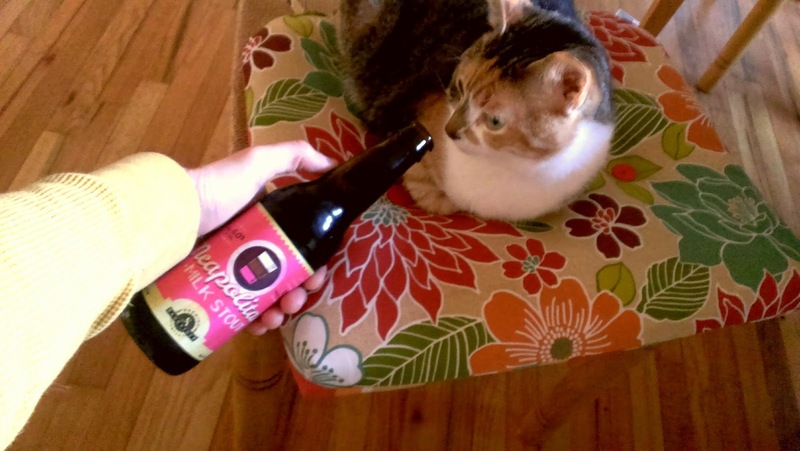 Saugatuck Brewing Company's Neapolitan Milk Stout is a cool brew, like Jim is when compared to Dwight on The Office. It isn't something I'd want to drink all the time because I don't want it to lose its wonder (so I guess I should be happy that it's only bottled around Thanksgiving). SBC's Neapolitan Milk Stout nets a solid 8.0/10. Should you be lucky enough to stumble upon a pack of this, rejoice! It's like no other beer I could possibly imagine.